InterComms profiles SR Telecom’s role in providing turnkey broadband solutions to provide last mile connectivity in over 120 countries worldwide. The telecoms market is coming back to life. Ongoing deregulation throughout the world is providing new opportunities for both providers and subscribers. Meanwhile, with the consolidation of ILECs (Incumbent Local Exchange Carriers) and CLECs (Competitive Local Exchange Carriers), the WISP (Wireless Internet Service Provider) model is emerging. In terms of network evolution, IP & traditional voice convergence and value-added services are becoming more and more useful and often mandatory. SR Telecom, the world’s leading supplier of fixed wireless access solutions, believes that Broadband Fixed Wireless Access (BFWA) is the right choice for isolated areas, and a strong alternative in dense urban environments as well. With a proven track record that stretches over a quarter century, SR Telecom has met the ever-changing demands of over 220 customers around the globe. More than two million lines owe their existence to the company’s solutions, and SR Telecom continuously improves its product line by investing extensively in research and development. A member of the WiMAX Forum, SR Telecom has led the way in the development and deployment of Non-Light-of-Sight/ Orthogonal Frequency Division Multiplexing (NLOS OFDM) technology, and deploys a wide range of BFWA networks. It is the world's first-ever manufacturer in OFDM, the technology chosen in WiMAX. Traditional stumbling blocks to the deployment of broadband networks include subscriber loop length, equipment costs and the expense involved in the deployment itself. Today, SR Telecom’s BFWA solutions provide a viable solution to all of these issues. Using its advanced NLOS OFDM technology, for example, SR Telecom can connect subscribers as far away as 30 km from the base station and provide the same high level of performance and service along the entire network. Additionally, its true NLOS systems and powerful network management tools allow for very easy installation. Thanks to advances in technology and emerging standards such as WiMAX, BFWA platforms provide the service and cost efficiencies to effectively compete with wireline networks. Further, BFWA platforms make it possible for operators to address market applications ranging from high speed Internet access and carrier-class voice services for residential users, for multiple E1 for SMEs and LEs, to cellular backhauling that offer a variety of new service capabilities in IP, TDM and ATM environments. SR Telecom has also built a strong and enduring reputation as a complete solutions provider, offering turnkey services that include network planning, network engineering, network design, installation, project management, installation, network management and maintenance services. SR Telecom is helping service providers achieve their goals by delivering adapted BFWA solutions. In Eastern Europe, SR Telecom’s field-proven solutions are deployed in 10 major cities, providing high-speed data and telephony services to business customers. The company’s solutions deliver maximum value to operators, enabling them to target multiple end-user segments through a common wireless platform. This allows service providers to significantly enhance revenues by offering subscribers the choice of data and voice, along with value-added services. Because SR Telecom solutions are both versatile and cost-effective, service providers can build winning business cases based on a low initial investment that is tailored to the existing demand, opportunities with a diversified customer database that includes both residential and business users, and the technology to generate high ARPUs. In the Middle East, SR Telecom has been chosen to install and operate a public broadband wireless access network, which will, for the first time, deliver data services to small and medium business communities in the region. The solution is designed to evolve with growing networks, and is scheduled to expand to residential subscribers as well. SR Telecom was selected for this project because of its recognized expertise and its ability to provide cost effective platforms that can evolve and grow as needs increase, allowing a service provider to maximize its business case. In Western Europe, SR Telecom’s solution has been selected for the deployment of a 100,000 line multi-service broadband fixed wireless access network. This solution was chosen over a number of competing technologies because of its carrier-grade reliability, unmatched scalability and superior coverage capabilities. 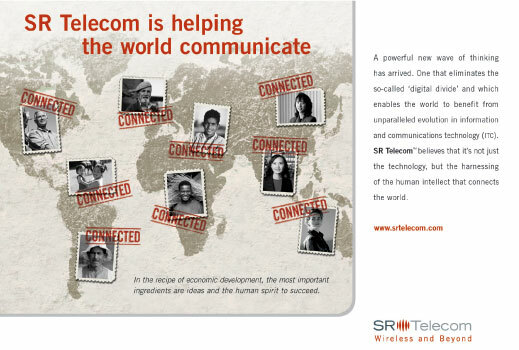 Moreover, SR Telecom’s solution is immediately capable of delivering integrated voice and broadband data services. The extensive access improvement initiative will bridge the existing telecommunications gap by delivering equivalent-to-urban services to suburban and rural communities throughout the region. The mission of SR Telecom is to overcome the current barriers to broadband access by pushing the boundaries of performance and service provider effectiveness in urban areas and to extend these capabilities to underserved areas, while preserving its commitment to customer satisfaction. These are key elements in SR Telecom’s vision for success. The company leverages its quarter century of experience in the fixed wireless market to develop broadband data and carrier-class voice platforms that are precisely adapted to the evolving needs of its extensive customer base around the world.